Semiconductor physics, quantum electronics and optoelectronics, 22 (1), P. 5-10 (2019). Semiconductor physics, quantum electronics and optoelectronics, 22 (1), P. 11-18 (2019). Semiconductor physics, quantum electronics and optoelectronics, 22 (1), P. 19-25 (2019). Semiconductor physics, quantum electronics and optoelectronics, 22 (1), P. 26-33 (2019). Semiconductor physics, quantum electronics and optoelectronics, 22 (1), P. 34-38 (2019). Semiconductor physics, quantum electronics and optoelectronics, 22 (1), P. 39-46 (2019). Semiconductor physics, quantum electronics and optoelectronics, 22 (1), P. 47-52 (2019). Semiconductor physics, quantum electronics and optoelectronics, 22 (1), P. 53-59 (2019). Semiconductor physics, quantum electronics and optoelectronics, 22 (1), P. 60-66 (2019). Semiconductor physics, quantum electronics and optoelectronics, 22 (1), P. 67-79 (2019). Semiconductor physics, quantum electronics and optoelectronics, 22 (1), P. 80-87 (2019). Semiconductor physics, quantum electronics and optoelectronics, 22 (1), P. 88-91 (2019). Semiconductor physics, quantum electronics and optoelectronics, 22 (1), P. 92-97 (2019). 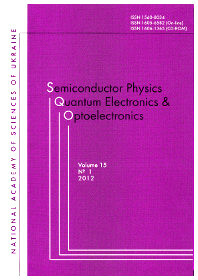 Semiconductor physics, quantum electronics and optoelectronics, 22 (1), P. 098-103 (2019). Semiconductor physics, quantum electronics and optoelectronics, 22 (1), P. 104-110 (2019). Semiconductor physics, quantum electronics and optoelectronics, 22 (1), P. 111-118 (2019). Semiconductor physics, quantum electronics and optoelectronics, 22 (1), P. 119-129 (2019). Semiconductor physics, quantum electronics and optoelectronics, 22 (1), P. 130-130 (2019). Semiconductor physics, quantum electronics and optoelectronics, 22 (1), P. 131-132 (2019).